Here’s another keeper from the sisters of Four and Twenty Blackbirds. We’re having a big festivus this summer and I’ve been testing out a few pies for the dessert. 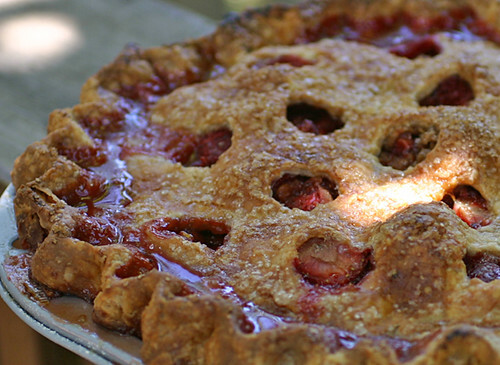 I would love to do their Caramel Apple Pie, but strawberries are much more apropo for this summer shin-dig. All of my excellent pies start with Patty’s pie crust. The secret is to make sure you get the pie nice and cold before plunking it into a hot, hot oven. I learned another new tip from the Hoosier Mama pie book called Crust Dust – it’s an equal amount of sugar and flour sprinkled on the floor of the pie before the wet fruit goes in. Make a double recipe of this crust. Wrap the dough balls in Saran and keep in the fridge until needed. Gently fold the dry ingredients with the strawberry mixture. Pour in wet ingredients, mounding at the center. Place on top crust – crimp edges and slit a few holes in the top to allow steam and juice to exit. 1 Tbsp or so of Demura Sugar – large grain! Place in fridge again for 15 minutes! Place in 450′ oven with an edged pan placed beneath on the bottom shelf. Bake for 20-25 minutes or until the crust begins to brown. Turn oven down to 375′ and finish baking about 30-35 minutes or until the inside starts bubbling up.